I'm back! I'm a little sad that my vacation is over already. It's never long enough, is it? At least it was fun. Did lots of fun things and even picked up a few new polishes. While I'm working on finishing up some blog posts, how about another lovely holo to look at? 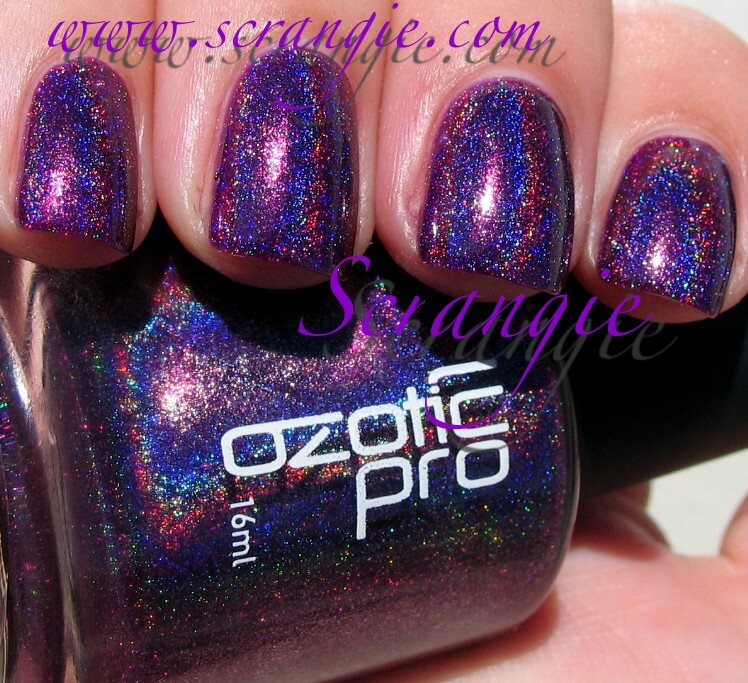 This one is Ozotic Pro 513, a purple linear holo. It was a gift from a friend who has excellent taste in polish, so it's even more special to me. Ozotic Pro 513. It looks a little darker and bluer in my picture than it does in real life. Plus, the hologram effect is always much better in person than it is in pictures, so imagine it a little redder and a lot more holographic. It is really, really gorgeous. 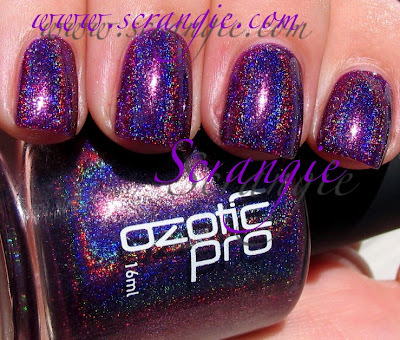 Darker colored holo shades aren't that common and this is one of the better ones. Ozotic's red holo is even more amazing. 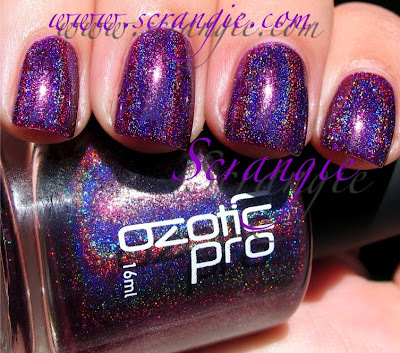 I only have a couple of the Ozotic holos, but the ones I do have are really impressive. I have a feeling that 2012 may be the year of the holo. I'm seeing lots of holographic polishes lately, and hearing lots of little rumors, so fingers crossed! are ozotics hologram effects better than the hits ones? i'd like too buy it, but i really don't kwon if it's worth it. LOVE this polish! It looks so wicked! Welcome back, no it never is long enough! 513 is beautiful. I can only hope 2012 is the year of holo! I think it's amazing that it's possible to make a nail polish this beautiful!!! *drools* if this is in real life even MORE beautiful... oh boy. good that I am already sitting :-D one of the most awesome polishes I have ever seen! omg this is amazing! definitely one to put on my wishlist! That looks gorgeous on you! And yay \o/ welcome back! More holo? Hell yeah! 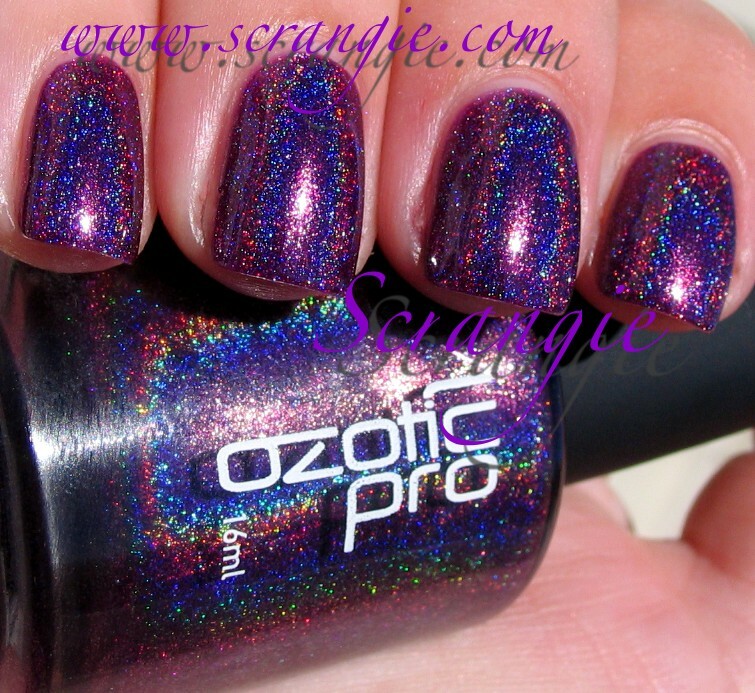 The Ozotic holos are gorgeous! I'm keeping my fingers crossed too! I adore holos, even though I don't have many. I NEED this color! Gah! Glad you had a good vacation. And, I totally know what you mean - they never seem long enough! SCRANGIE! Every time I see these Ozotic holographic polishes on you, I'm drooling like something crazy. STUNNING, and it's even better on person? GAH! I'll have to save up a lot before I dive into this brand. 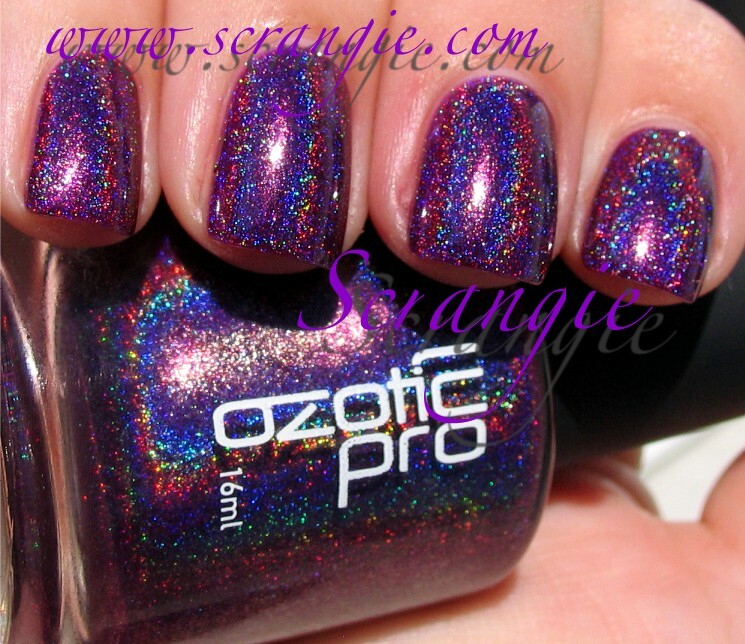 I keep seeing incredible swatches of these holos. I"d love to get my hands on some of those Ozotics! Ohmygosh this is totally amazing! This one is really pretty and I love it a lot. And I hae the Glitter Gal dupe too. Really pretty purples! But you're right, nothing beats the red #518 from ozotics. It is the moste beautiful holographic red there is! YAY, SHE'S BACK. Also that holo is boss, and I don't even really like purple. Wow! It looks insanely holo in your pics :)). I love it, it has a kind of glossiness that reminds me of old OPI ds polishes. what a gorgeous polish! Ozotic has some of the most awesome polishes i've ever seen! if 2012 is the year of the holo, it will be the BEST YEAR EVAH!! 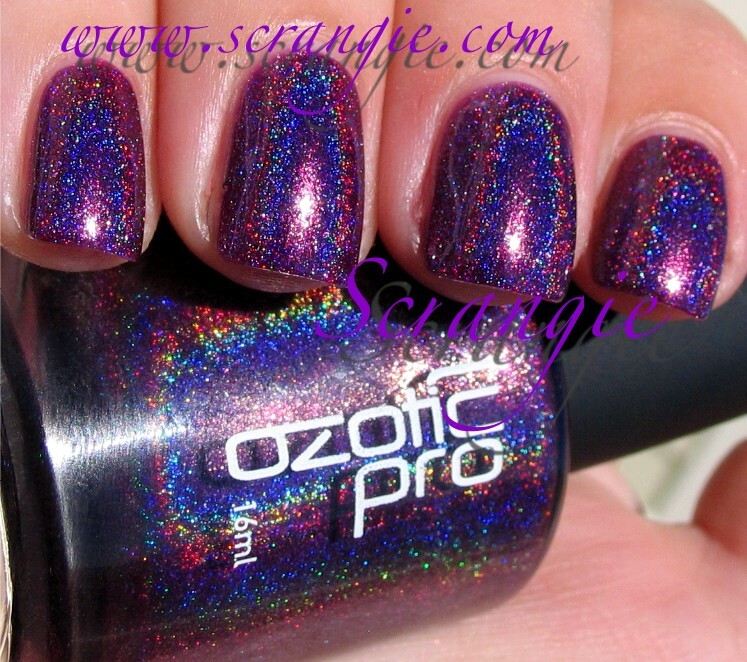 Gosh I hope you are right about 2012 being the year of holos, I missed out when China Glaze did the OMG and Kaleidoscope lines. So glad your back & enjoyed your vacation. This is beautiful. I truly hope I see lots of holos in the coming year. Need more! This is amazing. Gah, want! Where can Ozotic be purchased? Miss M, they're pretty similar. The HITS are more jelly based, these are more metallic, but they're both extremely awesome. MoLo and Tiffany, there's http://shop.llarowe.com/ and there's http://www.picturepolish.com.au, both carry Ozotics, but the selection changes frequently. Ozotic just changed their bottles, so they don't say Pro anymore, but they're still there!